For three weeks last year, Auckland hosted the first Liklik Luk Save Art Show at the Aesthete Gallery. A smaller version of the national art show Luk Save, held every September at the Royal Papua Yacht Club, Liklik Luk Save brought seven PNG artists’ work, on invitation, to the heart of New Zealand’s fine art trade with a very genuine and warm welcome. 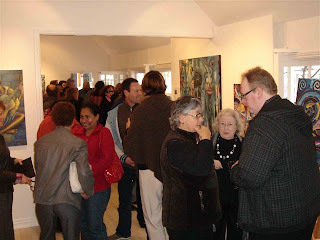 Pierre Peeters, owner of Aesthete Gallery, has built a reputation over many years for identifying and promoting New Zealand’s up and coming contemporary artists. He is renowned for embracing challenging and vibrant work and connecting artists with key private collectors and the general public. His invitation to Papua New Guinea’s finest was in keeping with his bold and determined approach to take the best of contemporary art to a wider audience. This was Peeters first event showcasing this market and said: “For a country that has had limited exposure to the art world, they have a lot to offer and it is worthy of being exhibited in high-end international art centers. Gickmai Kundun’s stunning sculpture work that graces our capital city was represented with artists Tom Deko, Martin Morubabuna, Alexander Mebri, Ratoos Haoapa Gary and Heso Kiwi being featured with two large canvasses from the late Philip Yobale collection. 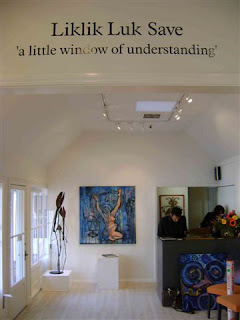 The work and the event were very well received both critically and commercially. The show experienced good attendance and strong sales. The key piece in demand turned out to be a substantial canvas from Ratoos Haoapa Gary, ‘Lo Moro’ with Gickmai Kundun and Alexander Mebri also selling on opening night. In total over half of the work presented was sold and, possibly most importantly, the work has gone to established private collectors from the New Zealand market. This is particularly significant for our artists as it dramatically opens the international market for their work bringing much-needed financial support and recognition to their professionalism. The Aesthete Gallery has consolidated their commitment to the PNG fine art community by inviting Liklik Luk Save back this year and is currently working with the PNG-based curator Amanda Adams of Luk Save to present a broader experience for 2011. It is great to read your post about the Liklik Luve Save Exgibition and that it recognizes how much Amanda Adams has done to promote contenporary PNG art. Every year I try to collect the catalogue she publishes of the work shown at the Luk Save Exhibition in Moresby to celebrate PNG Independence. I just wish that the PNG Government would recognize the contributions that PNG art makes to contemporary PNG culture and provide funding for art exhibitions and travel abroad. 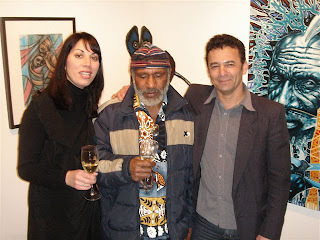 I recently co-curated with Michael Mel the exhibition Hailans to Ailans, which also had a program of art events bringing five PNG artists to London UK and to Victoria, Canada, In Canada the PNG artists exhibited together with First Native people of the Northwest Coast. 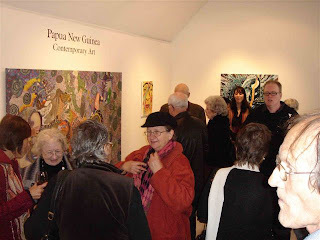 It was an outstanding success playing to overflowing crowds in both venues So, yes, contemporary PNG art is finally getting some international recognition and great to learn the work is beinning to sell so that these great artists can survive. 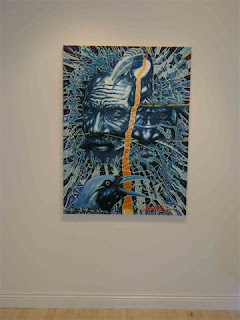 I am glad that you also drew attention to Giles Peterson, who is also now working with contemporary PNG artists. 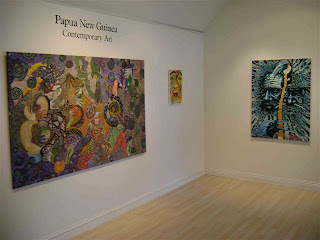 Please keeo posting reports on contemporary PNG art exhibitions because they need and deserve to be recognized. So thank you for this column and the great visuals. Thank you Amanda.